Cranial cruciate ligament rupture is the most common orthopedic injury in dogs. There are multiple surgical procedures that can be done to treat this disease, but two of the most popular “osteotomy” (cut in the bone) procedures are the TPLO (tibial plateau leveling osteotomy) and TTA (tibial tuberosity advancement). Both procedures can provide excellent outcomes and both have their potential complications. Infection can occur with any surgical procedure, but with orthopedic surgeries that involve implants, the risk is higher. That is why prior to an elective orthopedic procedure, the skin is evaluated for infection and antibiotics are used during the procedure and postoperatively to lessen this risk. If a dog licks or chews at the incision, this is highly likely to result in an infection in the immediate postoperative period. Late infections are also a potential possibility as well, because urinary tract, skin, oral, or ear infections can spread to the site of an implant or area of inflammation (osteoarthritis). If the site of an orthopedic surgery becomes infected, the implants have to be removed to clear that infection completely. This is because the stainless steel implants do not have a blood supply and the bacteria stay on the implant in a “biofilm”. 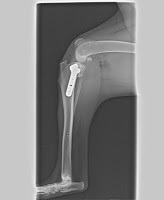 The implants can be removed as long as the bone has healed. When we are dealing with removal of TPLO or TTA implants, the level of difficulty and invasiveness is dramatically different between the two procedures. Below are radiographs of each procedure showing the metal implants. 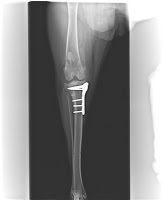 The TTA implants involve a cage (square) that acts as a spacer, and during healing bone grows into this cage. 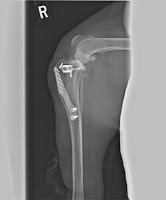 There is also a fork plate and screws that hold the osteotomy in place. 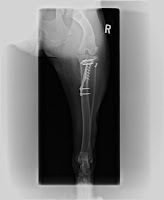 When removing TTA implants, the fork plate and screws easily can be removed, but the cage must be “cut” out of the bone, leaving a large defect that has a high risk of fracture. This surgery to remove the cage that is encased in bone is invasive and difficult. The TPLO, on the other hand, doesn’t have a cage and only has a plate and screws, which can easily be removed because the bone doesn’t grow into them. So, when discussing the surgical options for a cranial cruciate ligament rupture, all the potential complications need to be discussed and the risks weighed. Infection risk is low at 7.4% (Gallagher AD et al. Implant removal rate from infection after TPLO in dogs. Vet Surg. 2012), but if it is your dog that needs the implants removed, the process is less complicated to have had a TPLO over the TTA!